The Museum of London tells us about pioneering female photographer Christina Broom, who captured many aspects of life in the first decades of the twentieth century, including the campaign for women’s right to vote. Then they challenge you to write your own poem capturing a moment of struggle, drama and change, as Broom did. Christina Broom, Britain’s first female press photographer, was active between 1904 and 1939, a time of great change and upheaval in London. Known professionally as Mrs Albert Broom (women were known by their husband’s name), she captured iconic moments from the first half of the twentieth century, including the campaign for votes for women and the dramatic parades and processions. The ‘suffrage’ movement in Britain was made up of different groups who campaigned in different ways for women’s right to vote. Some groups were peaceful and sought to change people’s minds through demonstrations, petitions and lobbying; this is how the suffrage movement started and these campaigners were known as suffragists. Other groups – such as the Women’s Social and Political Union, founded by Emmeline Pankhurst, born of her frustration with the moderate, gradual tactics of the suffragists – sanctioned more extreme actions in the cause of equality. Their methods included vandalism and hunger strikes. The press called them Suffragettes. The groups differed in tactics but were united in their message, and often worked together. In 1918, the Representation of the People Act gave women over 30 (meeting certain requirements of status and property) the right to vote, and in 1928 this was extended to all women over the age of 21. 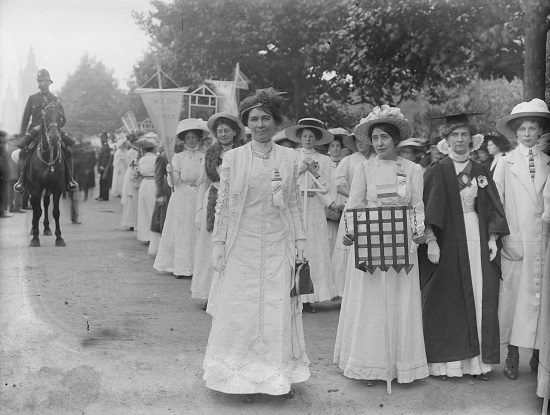 With the click of her camera, Broom captured the feeling of a whole movement, photographing many of the key members of the suffrage movement including Sylvia, Emmeline and Christabel Pankhurst, Emily Wilding Davison and Emmeline Pethick-Lawrence, as well as bystanders and supporters of their cause. Her images are part of the story of a movement which ultimately changed the lives of women throughout the world. Can you capture a moment like Christina Broom? Using the images below to inspire you, create a poem which captures a moment, much like Christina Broom’s photographs. You can take inspiration from anything in Broom’s images, her own life, or the story of the suffrage movement. We have included some workshopping ideas to get you writing, and you can either create a poem from these or write about something else here which catches your imagination. This photograph shows some of the most iconic women in the suffrage movement: (left to right) Emmeline Pethick-Lawrence, Sylvia Pankhurst and Emily Wilding Davison among many other Suffragettes. On this occasion, these women were taking part in a ‘Prisoners’ Pageant’, in which women who had been jailed for their campaigning marched together as a group. You may be familiar with photographs of the Suffragettes protesting but Broom also captured images of their exhibitions, showing the other activities they undertook to promote the cause. Depicted in this photograph are Suffragettes, including Emmeline Pankhurst, running a sweets stall at The Women’s Exhibition, held at the Prince’s Skating Rink in Knightsbridge on the 13-26 May 1909. The Exhibition was organised by Pankhurst’s Women’s Social and Political Union. More than 50 stalls were set up at this event and all of the proceeds from the Exhibition went into the Union’s suffrage campaign fund. 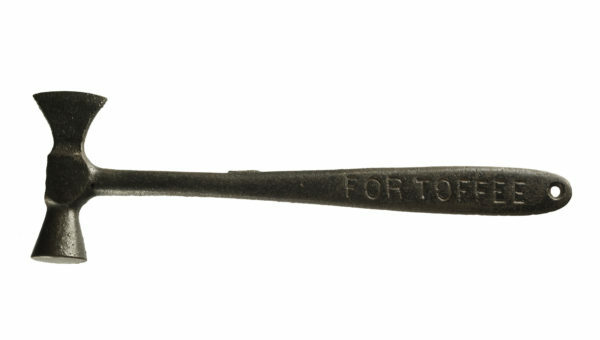 This toffee hammer was used by the militant Suffragettes who took part in a window smashing campaign – breaking the windows of shops and offices in London. 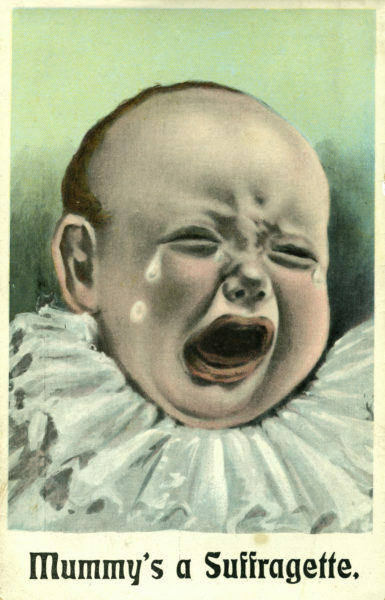 This became an official policy of the Women’s Social and Political Union in November 1911 to show their disgust with the government and to outrage the public; many Suffragettes were arrested for these actions. In 1914, Emmeline Pankhurst described this tactic saying “the broken pane of glass is the most valuable argument in modern politics”. These hammers were an ideal tool for smashing windows as they were readily available and small enough to discreetly conceal in clothing. From 1909, the Women’s Social and Political Union gave medals to those Suffragettes who served prison terms for militant actions. This hunger strike medal was given to Florence Haig in 1912 upon her release from prison. Florence had been sentenced to four months imprisonment after smashing the windows of D H Evans department store in Oxford Street and undertook a hunger strike during her last few days in prison. 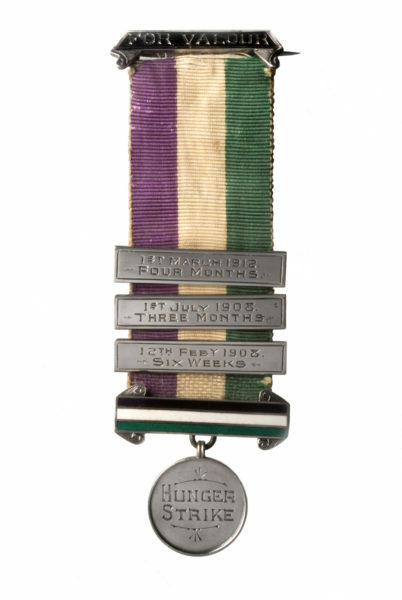 The enamel tricolour bar on the medal indicates that this Suffragette underwent at least one force feeding in prison. – Imagine you are one of the women on the march in Hyde Park: what has inspired you to champion this cause? How do you feel about being jailed for action demanding the right to vote? What is the mood and atmosphere of the march? – How do you think their audience sees them? As brave people or troublemakers? Imagine you are walking through Hyde Park and you catch sight of the Pageant – what do you think? – Imagine you are a mother campaigning for the vote, chafing at the widely-held belief that women should remain at home as mothers and homemakers. Try to capture the moment you are sneeringly handed one of these cards. – What do you think about the idea of ‘womanly’ or ‘manly’ behaviour in the past or today? – You could write about a time when you speak your mind or other people react in an encouraging or difficult way. – Imagine you are Christina Broom. Why might you want to photograph the cake stall as well as the processions outdoors? Imagine the charged atmosphere, the colours (the Union’s official colours were purple, white and green), the smell of baking and the determination in the air. You could try and capture this moment just as Broom does. – Emmeline Pankhurst is third from the right. How might she feel right now, at this big gathering of people who have all joined her cause? – Look at the clothing, flowers and presentation of the stand. Thinking about the debates of the time about whether a woman belonged at home or not, does their decision to present themselves in this way, baking cakes and sweets, seem significant? Imagine what they are thinking as they hand over a cake, in their tight corsets and huge hats, all in subtle support of a radical movement. – Many Suffragettes would never have broken the law before. Imagine the moment where your speaker feels driven to become part of the window smashing campaign. – Do you think window smashing would have helped or hindered their cause? Can you think of any different ways the Suffragettes could have forwarded their cause without undertaking violence? Or was this the only way to draw attention to the fight for the right to vote? – Imagine the moment you are handed this hunger strike medal. What do you feel – pride, exhaustion, resentment, triumph? Does it bring back memories of prison? – How do militaristic items like this contrast with the earlier photographs of cake stalls and peaceful marches? Imagine how a young Suffragette’s ideas might change as they take part in the struggle for equality. Would you like to see more of Christina Broom’s work and be inspired by her photographs of the Suffragettes and the city of London as it would have looked a century ago? These photographs and many more are displayed in the exhibition Soldiers and Suffragettes: The Photography of Christina Broom at the Museum of London Docklands. 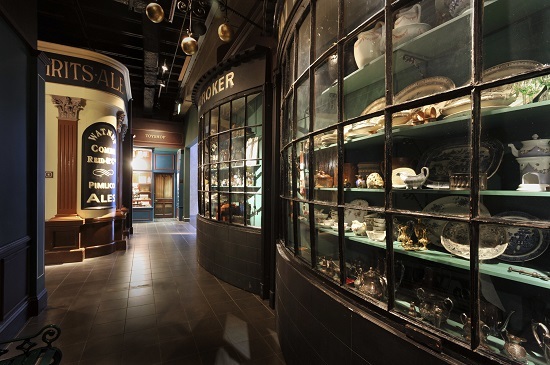 The exhibition is free and open from 10am-6pm every day until 1 November.